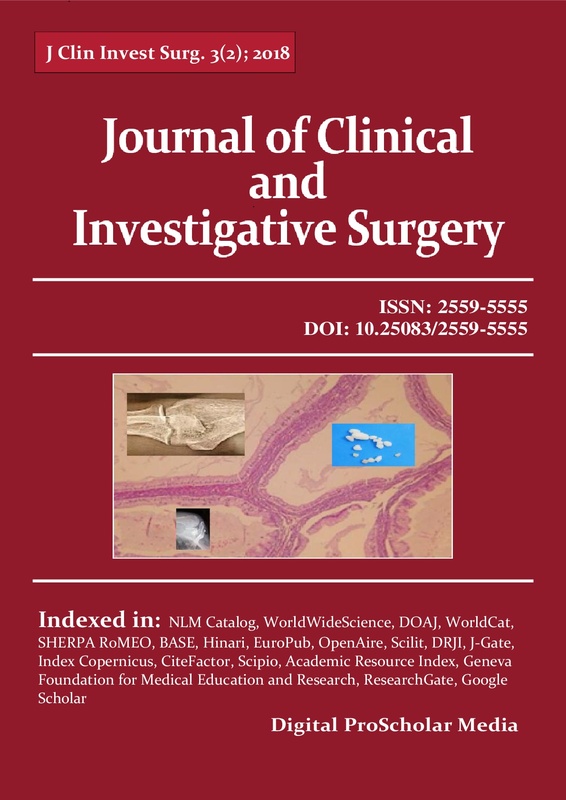 Journal of Clinical and Investigative Surgery is published twice a year, being designed for a translational and integrative mission. This journal is dedicated to publish original research papers, reviews, case presentations, surgical techniques, letters to the editor, rapid and short communications (not exceeding 3 printed pages) on surgical topics. The area and subjects covered include all aspects related to surgical disciplines, being equally focused on basic research and clinical studies. We intend to provide deeper insights into clinical, experimental and investigative surgery, able to support scientific advancement of surgical disciplines to the ultimate benefit of patient care and rehabilitation. This journal is conducted by international norms of academic publishing, being listed by International Committee of Medical Journal Editors (ICMJE), member of CrossRef, and indexed by several International Databases. J Clin Invest Surg. is an online and open access journal, no charges being received for submission, review, and publication of articles. The journal adheres to the philosophy that high quality, original ideas and information should be readily accessible and freely shared within and amongst the scientific community, with the stipulation that the authors be acknowledged for their knowledge and contribution. Authors are encouraged to supply the names of two potential referees, and/or of referees that they do not wish to review their paper. The decision regarding the selection process of the reviewers belongs to Editor(s). Authors of Invited Reviews should supply the name of the Guest Editor who invited them to write. J Clin Invest Surg. is licensed under a CC BY-NC-ND 4.0 License. For a complete journal coverage see About This Journal and Aims & Scope.